So instead of using F*** words like "frustrated…", "fed up…" and "finished…" use my favorite F*** word… FREE! Ask the dispatch furniture vendor, "what services are free?" Free often means less project stress and allows you to be one step closer in making an informed cost-efficient decision and besides...who doesn't like free? As an example, Xybix offers several FREE services to guide you in your next purchase decision for dispatch furniture. 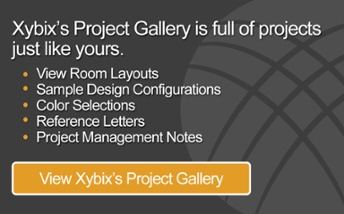 First, you'll talk to your Xybix Territory Manager and tell them a little more about your project. After that, you will schedule an on-site meeting called a “Meet & Measure.” During a Meet & Measure, your Territory Manager will walk you through every detail of your wants for desk features, equipment needs, the finishes of each station and then they will take measurements of your space. If you are building a new building, Xybix can do the same thing using blueprints or an AutoCAD of the space. If you haven’t started building the building yet, Xybix’s in-house, degreed design team can even walk you through an ideal room layout and space footprint based on the number of consoles you want to place in the center. And yes, all this is free, free, and FREE. Xybix has its own design team comprised of 8 full-time Xybix employees who have design degrees with specialty in space planning. They create designs for PSAP's throughout the country every day and can provide the best recommendations for your specific space. Room dimensions, equipment information, and specific needs are provided to the Designer assigned to your project by your Territory Manager. The design team then works their magic to provide an initial proposal drawing. This drawing will show 2D and 3D room renderings, 2D and 3D desk typicals with desired features, as well as equipment for each specific station. All of this provided to you at you guessed it, no cost! Xybix is not shy about sharing what our typical dispatch consoles cost. Given that each project is unique, these costs are generalized based on the project size, quantity, and desired extras. If you are in the early stages of project management and interested in costs, a budgetary cost estimate is available upfront (and at no cost to you) to help with budgeting purposes. A more specific project quote will be put together after visiting your PSAP, measuring your space, and gathering all the appropriate details. This quote will be itemized with every piece of the puzzle that makes up a full console in your specific project and each piece can be adjusted (added/subtracted) as necessary. This is all part of that FREE package we've mentioned! As a manager of a large-scale project, you may feel intimidated on where to start or how to best use your funds. Having these FREE services allows you to have the proper resources you need to make an informed decision while making the best use out of your limited funds and budget.